This past December in Madrid Marc Fuentes and Eva Aldea started to promote the Archivo Cero (File Zero) contest where prizes are given for the best animation, the best script and the best comic. The contest was publicized in different high schools throughout the city. A total of 6 high schools decided to distribute the publicity among their students. Some 4000 fliers were given out. The following week Expocómic took place. 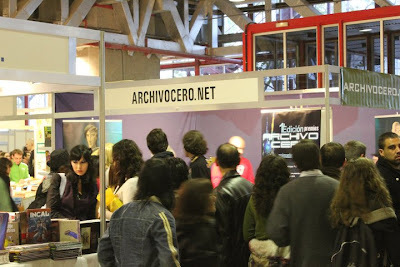 It´s a comic book fair and Archivo Cero was also represented there. Close to 5000 young people received wristbands with information about the comic series and its website. Marc and Eva had the opportunity to meet some of the participants and strike up some very interesting conversations with them and learn from them as well. During the four-day festival, Marc and Eva had a team of 15 volunteers from Madrid, to whom they would like to thank publicly via this blog for their time and hard work. In addition to their participation at the high schools and at Expocómic, Marc and Eva, with the help of Student Venture staff member Mariano Pineda, also led a training time for a youth group at 3 Cantos (a neighborhood of the Madrid metro area).